Click here to visit the Middle C Music Shop! The Fantastic First Installment in the Kate the Great Picture Book Series! 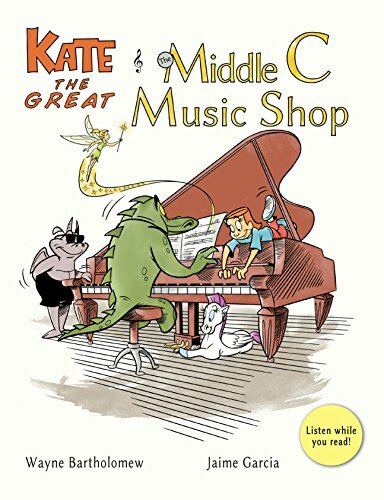 In this melodic book, Kate and her friends visit The Middle C Music Shop and discover the instruments! Music generates all kinds of sensations in our friends, stimulating their imaginations. When Kate plays the oboe, it sounds like a duck! When Louie plays the piano, it sounds like hammers hitting an anvil, but Kate gets more delicate notes reminiscent of little fairies! What if we could see the sensations and emotions music evokes? What do these instruments sound like to you? To help you decide, click or tap here to listen to the instruments while you read! Louie's winding up! Do you know the name of this instrument? "Look, Mom! I can read pictures!" Kate the Great and the Middle C Music Shop is a story in pictures. It promotes visual literacy. A visually literate person can read facial expressions and body language. He or she can understand ideas conveyed through images without the assistance of words. Reading pictures is a great way to exercise the brain and improve comprehension! It requires careful observation and thoughtful analysis. With technology, visual presentations are more prevalent than ever! How many facial expressions can you count in this picture? When books and computers work together, readers benefit from an interactive experience that can be fun and educational. 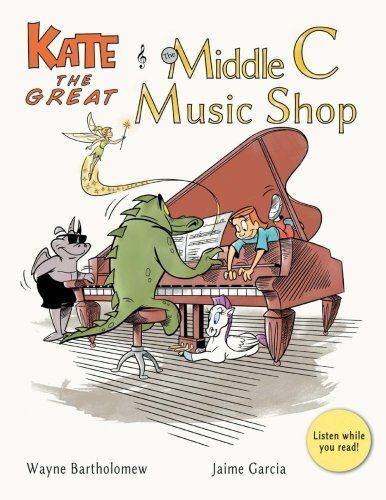 Kate the Great and the Middle C Music Shop incorporates interactive elements that you can access on Kate's website! Specifically, with the aid of video and sound, Kate's picture book challenges readers to use their five senses. When the five senses work together, sometimes one sense will trigger another. This is called synesthesia. In the book, Harlan plays the contrabass clarinet. We can SEE him play it. On the website, there is a video clip that features the contrabass clarinet. We can HEAR it being played. What does the instrument sound like? Well, to Kate, it sounds like a big shaggy dog! That's what leaps out of the contrabass clarinet and licks her face! The SOUND triggers a VISUAL association. This association is known as synesthesia! Join Kate for a musical adventure that combines visual literacy and technology to create a true cross-sensory experience! "We Hope You Enjoy Our Work!" Wayne and Jaime worked really hard on this book, and they hope you enjoy it. Leave a review on Amazon! Or fill out the form on the contact page! About the author: Wayne Bartholomew holds a master’s degree in English, which he earned from Youngstown State University. He is also a graduate of Kent State University. Through KSU’s School of Library and Information Science, he earned an M.L.I.S. Wayne has published political cartoons in YSU’s student newspaper, The Jambar. About the illustrator: Jaime Garcia Corral is a comic book artist. His professional career includes work for companies like Disney (Disney Classics), Full Stop Media-Warner Bros. (Looney Tunes, Scooby-Doo, Tom & Jerry) and DC Comics (Scooby-Doo), among others. His work has been published both in European countries, like the U.K., Germany, Sweden, Denmark, as well as in the U.S.A. He has also done illustration for animation.